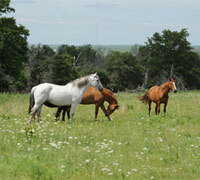 The Bureau of Land Management is hosting an all-day public tour of two wild horse long-term holding pastures in Hominy, Oklahoma, about an hour from Tulsa. 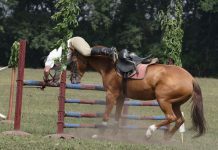 The tour, which will take place on Saturday, June 4, 2011, from 8 a.m. – 5 p.m., will give the public an opportunity to observe wild horses roaming in a natural setting across thousands of acres. The public must make reservations by May 20. Visitors will be shuttled to the pastures by the BLM from Tulsa; no personal vehicles will be allowed, as the pastures are on private property. Lunch may be purchased during the tour for up to $10 per person. Attendees should wear casual clothes, comfortable shoes, and rain attire if needed. Cameras and video cameras are welcome. Tour date and time: Saturday, June 4, 2011, from 8 a.m. – 5 p.m. The BLM estimates that approximately 38,400 wild horses and burros are roaming on BLM-managed rangelands in 10 Western states, based on the latest data available. Wild horses and burros have virtually no natural predators and their herd sizes can double about every four years. As a result, the agency must remove thousands of animals from the range each year to control herd sizes. Off the range, there are 41,200 other wild horses and burros that are fed and cared for at 23 short-term corrals and 21 long-term pastures. As of April 2011, there are approximately 12,600 wild horses and burros in short-term corrals and 28,600 wild horses in long-term holding pastures in the Midwest. Animals gathered off the ranges are taken to short-term corrals to be examined by a veterinarian, receive vaccinations and a freezemark, and prepared to enter the BLM’s adoption program or be sent to long-term pastures generally if they are over the age of six. The long-term holding contracted ranches range in size from 1,100 acres to 46,000 acres on which the wild horses are free to roam. All wild horses and burros in holding, like those roaming the public rangelands, are protected by the BLM under the 1971 Wild Free-Roaming Horses and Burros Act. For more information about the tour or about the program, please call 866-468-7826. Why does the BLM show a beautiful meadow with happy horses in them. They should picture the horses in their real world living conditions in those pens, taking them from the lands they belong on. Let the Mustangs go to sanctuaries, like the one Ms Pickens has and is willing to take the Mustangs. 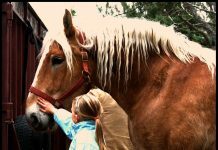 And now… the Nev legislature is about to pass a bill that would prohibit the Mustangs from water access and fine who ever provides it to them. Do you hear how much power the cattle/sheepmen have in Nev? Isn’t that outrageous!!!!! their habitat is the area.